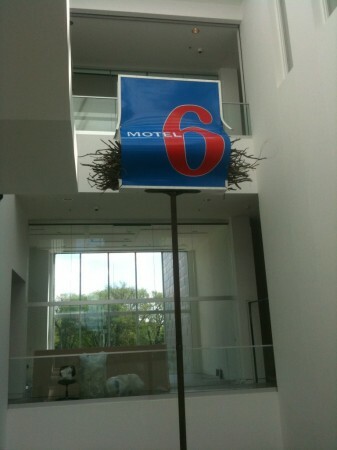 There is a sign, specifically a Motel 6 sign, firmly planted in the Atrium of the Rochester Art Center. The sign attempts to contain an eagle’s nest, which bulges from the bottom and spilling through the sides. This work is part of an a new solo exhibition by international artist Miguel Calderón titled Color Bleed which open this Saturday, May 12th. To create this piece, the artist along with team at the Art Center, worked with a local sign company to replicate the sign, build the nest and finally remove a glass panel in the atrium roof and hoist the piece into place. A there it will sit, lofted between the second and third floor for the next year. The relationship between artist, curator and preparator is an often hidden aspect in the production of an exhibition. Curators and preparators act as advisors, engineers, scavengers, liaisons, construction and demolition teams and in many other roles to realize the vision of the artist. The intent of the MAKING IT blog series is to provide some insight into how art work is created, including some of the behind the scenes mechanisms. There is a mixture of hard work, excitement, exhaustion and ultimate satisfaction in helping produce an exhibition. Over the past year this exhibition has taken form through ongoing discussions with chief curator Kris Douglas and eventually preparator Phillip Ahnen and other installation support staff. Calderón’s developed several new works for the exhibition (including a site specific installation using a exterior wall at a school in Rochester) each containing its own set of challenges. Many of the simplest aspects of any installation are filled with complicated details, but the idea is that you never notice any of the supports which make the piece possible. From early sketches to basement mock-ups to frequent cell phone installation shots it has been intriguing to witness the exhibition take form. Here are a few shots of the exhibition installation to give you a taste of what to expect. If you are interested in checking out the work yourself here is the information on the exhibition and opening in Rochester this weekend. Look for more posts in the near future with further details on how other pieces in Color Bleed were created. Miguel Calderón (born Mexico City, 1971) is regarded as one of the most important artists of his generation. In 1994, he founded the independent gallery “La Panadería,” an initiative that contributed to the internationalization of a generation of Mexican emerging contemporary artists during the 1990s. Focusing primarily in photography, film and video, his practice centres on the observation of human interaction and takes advantage of what is at hand to create low budget videos and installations. For his exhibition at the Rochester Art Center, the artist will realize a number of major site-specific works (including an off-site installation), a new body of photographs, and an artists book. A key component of the project will be an artist residency, with Calderón working and making photographs with students, and giving a lecture to the public. Various solo exhibitions include: a Bestseller, Panorámica, Museo Tamayo de Arte Contemporáneo, Mexico City (2009); La discípula del velocímetro, Prospectif Cinema, Georges Pompidou Centre, Paris, France (2008); Anónimo Alemán, Vacío 9 Gallery, Madrid, Spain (2007); Miguel Calderón, kurimanzutto Gallery, Mexico City (2006); México vs. Brazil, 26 Sao Paulo Biennial, Brazil (2004); Forcing the Forces of Nature, Andrea Rosen Gallery, NY, US (2003) and Gran dote, La Panadería, Mexico City (2001). Group exhibitions include: Fetiches críticos: residuos de la economía general, Museo de la Ciudad de México, Mexico City (2012); Mexico: Expected/Unexpected, Maison Rouge, Paris, France (2008); Playback, Museé de Art Moderne de la Ville de Paris, France (2007); Viva México!, Zacheta National Gallery of Art, Warsaw, Poland (2007); 7th International Photo Triennial Esslingen, Germany (2007); Escultura Social a New Generation of Art from Mexico City, Museum of Contemporary Art Chicago, IL, US (2007); Freakshow an Unnatural History, Baltic Centre for Contemporary Art, UK (2007); La era de la discrepancia, MUCA-UNAM, Mexico City (2007); Distor, Museo de Arte Carrillo Gil, Mexico City (2006); 7TH Sharjah Biennial, UAE (2005); Yokohama 2005:International Triennal of Contemporary Art, Japan (2005); Only Skin Deep: Changing Visions of the American Self, ICP, NY, US (2003); Fantastic!, Mass MOCA, North Adams, MASS, US (2003); Ciudad de México: An Exhibition About The Exchange Rates of Bodies and Values, PS1 Contemporary Art Center, NY, US (2002)and Tele[Visions], Kunsthalle Vienna, Austria (2001). Making It lifts the curtain on art-making around the state with posts that go inside the process of making and showing work. You’ll find these visually-oriented little pieces on both the Education and Community Programs’ blog and here, on the mnartists.org blog, and they’ll include a broad-mash up across disciplines, with everything from staff dispatches from Arty Pants and Open Field to rehearsal notes and studio visits, maybe even a few DIY tutorials by and with Minnesota artists.